Have you made Best Ever Sponge? 1. 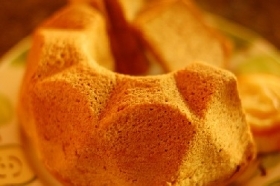 This is a favorite never-fail sponge recipe: it does not contain liquid or butter, which makes it ideal for Swiss rolls. 2. It is simple to adapt to many flavors and will work as a cake or a roll. 3. Have eggs at room temperature. 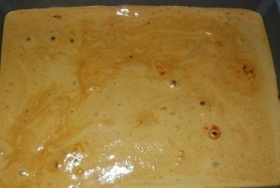 Beat whole eggs in small bowl with electric mixer until thick and creamy (the small bowl is necessary to give maximum volume to eggs); beating time on a moderately high speed should be about 7 minutes Add sugar, about 1 tablespoon at a time, beating after each addition until sugar is dissolved. 4. While eggs and sugar are beating, prepare pans by greasing evenly (see lift of pan sizes below); and sift dry ingredients together 3 times, to aerate and mix the flours. 5. 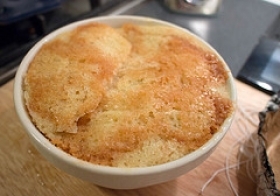 When sugar is dissolved, transfer mixture to larger basin; this makes it easier to fold the ingredients through the egg mixture *it is not necessary to transfer the 2 egg mixture to a larger basin). 6. Sift the flours over the egg mixture, use a spatula to lightly fold the flours through; heavy handling at this stage will give a flat, tough sponge. 7. Spread mixture evenly into pan, bake in moderate oven for cooking time specified below. 8. When cooked, sponge will have shrunk very slightly from side of pan and top of sponge will feel springy when touched gently with fingertips. 9. Turn sponge immediately onto wire rack to cool, then reverse sponge so that wire rack does not mark the top. 10. Cake Pans and Cooking Times: 2 egg: Deep 20cm round cake pan or recess pan about 20 minutes A deep pan is preferable rather than a sandwich pan as the sponge will be less crusty on top because the high sides protect the top during cooking. 11. 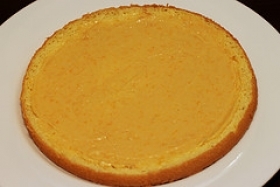 3 egg: 2 deep 17cm cake or sandwich pans about 15 minutes, or 25cm x 30cm Swiss roll pan about 12 minutes 4 egg: 2 deep 20cm round cake pans about 20 minutes, or deep 23cm round cake pan about 40 minutes Variations: Citrus: Beat in 2 teaspoons of your favorite grated citrus rind with the sugar. 12. Try lemon, mandarin, lime, orange or grapefruit. 13. Nut: Fold in 1/4 cup of any type of ground nuts with the flours. 14. Chocolate: Fold in 60g grated dark chocolate with the flours. 15. Fill and ice sponges as desired. Keeping time: 2 days.